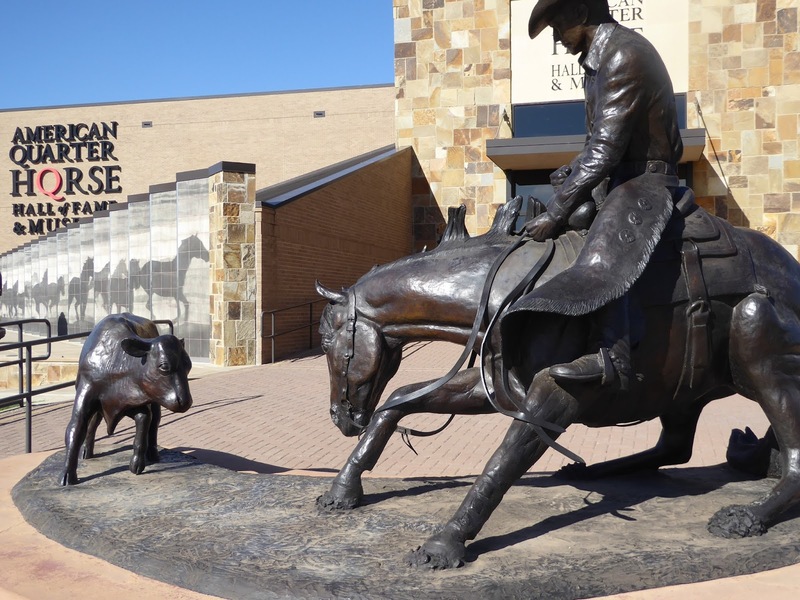 Americans love horsepower, but Texans really love their horsepower be it four hooved, two- , four- or more-wheeled. "But you must see it," we were told after explaining that the Good Girls' idea of camping was winding up in the room farthest from the lounge at a Hilton. So we did and they were right, you really must see Jack and Trent Sizemore's Travel and RV Museum. 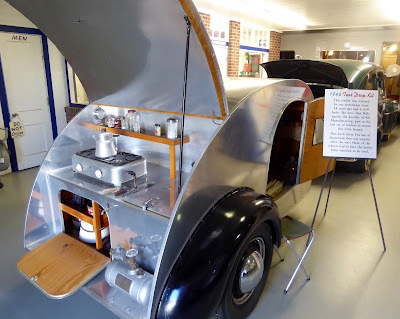 The 1946 Tear Drop came as a kit. Photo by Judy Wells. RVs from teeny tag-alongs to behemoths of the road are displayed as you might have seen them used, many surrounded by grills, chairs, toys and sports gear of appropriate ages. The "Age of Aquarius" VW van caught our eyes, of course, as did the monster house on wheels from the Robin Williams film, "RV." The late Robin Willliams filmed in this. Photo by Judy Wells. 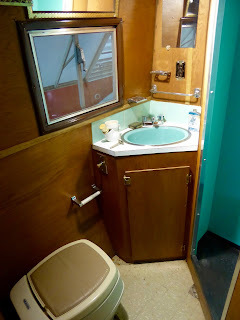 Remember-this type memories popped up as we peeked inside and "traveled" through styles of the eras like the oranges, mustards and olive greens of kitchens, burnt orange shag carpeting and aqua sinks in bathrooms. Remember aqua tile and porcelain bathrooms? Photo by Judy Wells. Classic motorcycles fill wall space in the vast two-room "garage" and all come with signage on the history, restoration process and other interesting details. Ron and Marilyn Smith. Photo by Debi Lander. 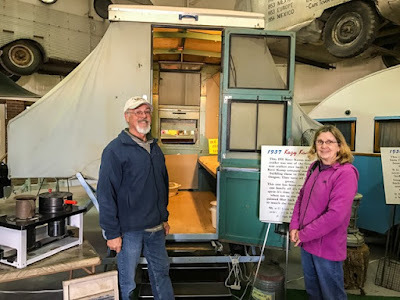 Our advisors were right, it is a find but our favorite find of all was meeting and comparing travel tips with Ron and Marilyn Smith of Chaumont Bay, NY, who detoured to see the museum during their 11,000-mile cross country RV trip. Refrigerator, three-time Champion of Champions, the first to break the $2 million winnings record. Photo by Judy Wells. 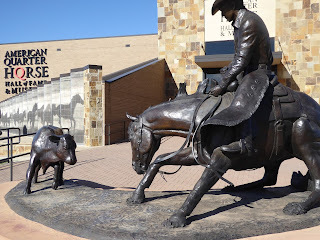 If you are like us, it will take awhile to get inside the American Quarter Horse Hall of Fame and Museum because the outside Wall of Honor Plaza is so interesting. A wall of photographs provides a handsome backdrop for bronze statues of racing, cutting, ranching and pleasure Quarter Horses and their breeders. Keep going, though, because there's good stuff inside. The Grand Hall is quite impressive with a large medallion of a Quarter Horse at the far end flanked by panels with names and photographs of those whose efforts have made the breed a success. 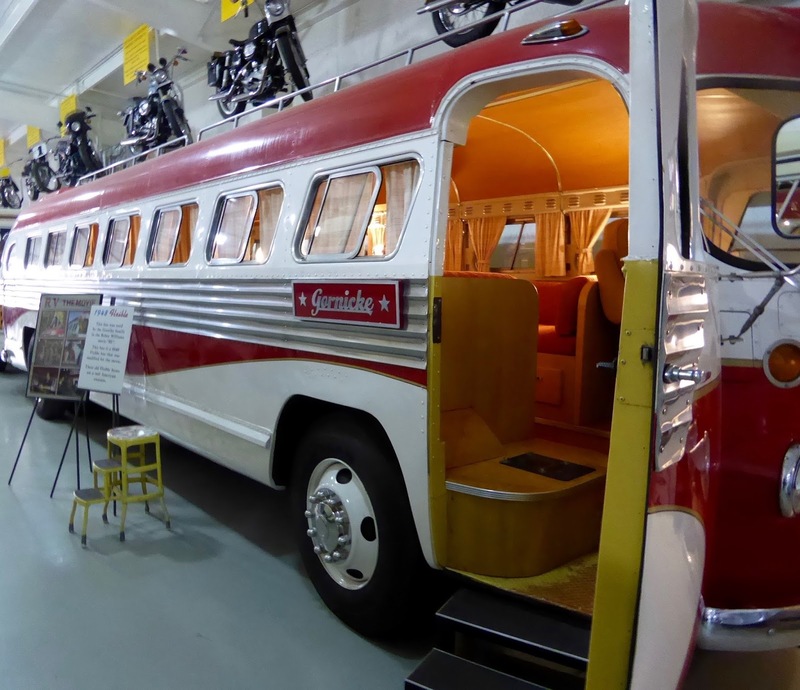 There's a nifty gift shop and a film theater, too. 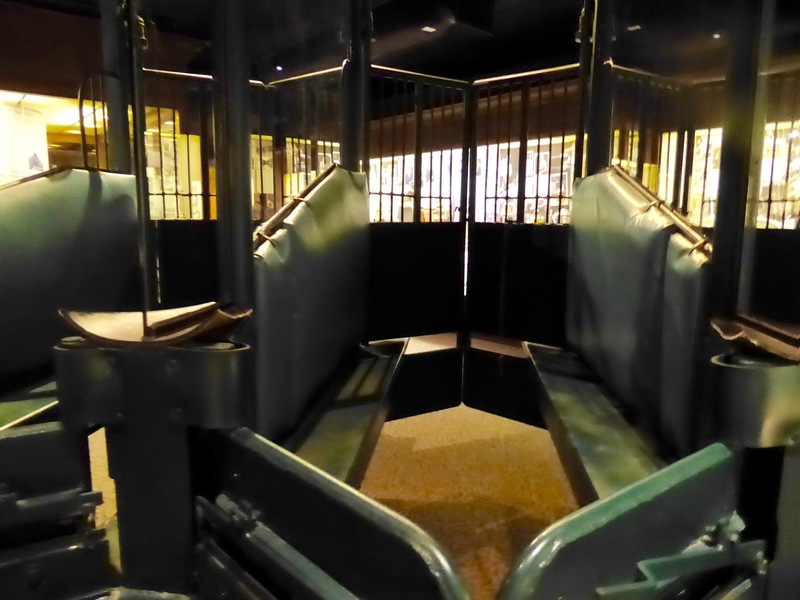 Slide the lighted panel along the horse to see the inner workings of the entire animal. Photo by Judy Wells. On the second floor, interactive displays chart the Quarter Horse inside and out, follow the history of its development and show standout examples of the breed. Quarter Horses are known for their versatility so visitors can try out a Western and an English saddle to see which they prefer. Race horse's eye-view of the starting gate. Photo by Judy Wells. It will probably be your only chance to see a race track starting gate up close. After all, the first American race tracks were quarter-mile straightaways where settlers, who didn't have time to clear any larger spaces, matched their speediest horses. 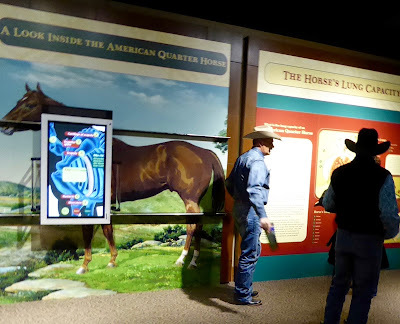 Another room is filled with displays of the development of America and the West, from Native American life and early ranches to the stock work, racing and recreational contributions of Quarter Horses. 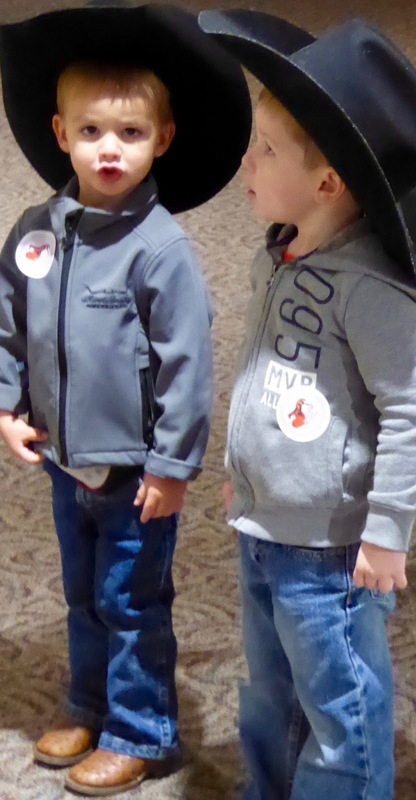 With the rodeo in town, fellow visitors from ranchers to little buckaroos made our visit especially interesting. 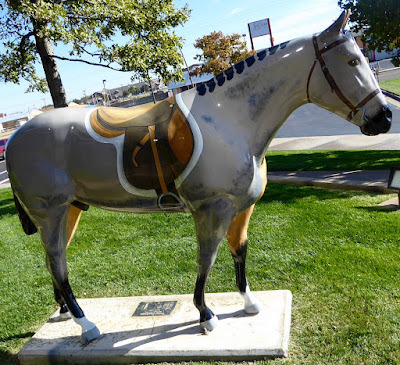 Having owned and loved a Quarter Horse for many years, Judy was between memory lane and horse heaven, but time was a' wasting so we skipped the library and research center. The museum served another major purpose for the Good Girls as we made our way around Amarillo. The area is flat, East looking pretty much like West, so unique signs and buildings like this one told us if we were going in the right, or often wrong, direction. "Blue Blaze" at Amarillo College. We looked for another kind of horse as we drove around. 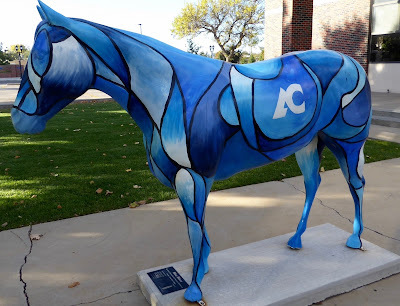 Hoof Prints is Amarillo's answer to the pigs, fish and jaguars public art projects of other cities. 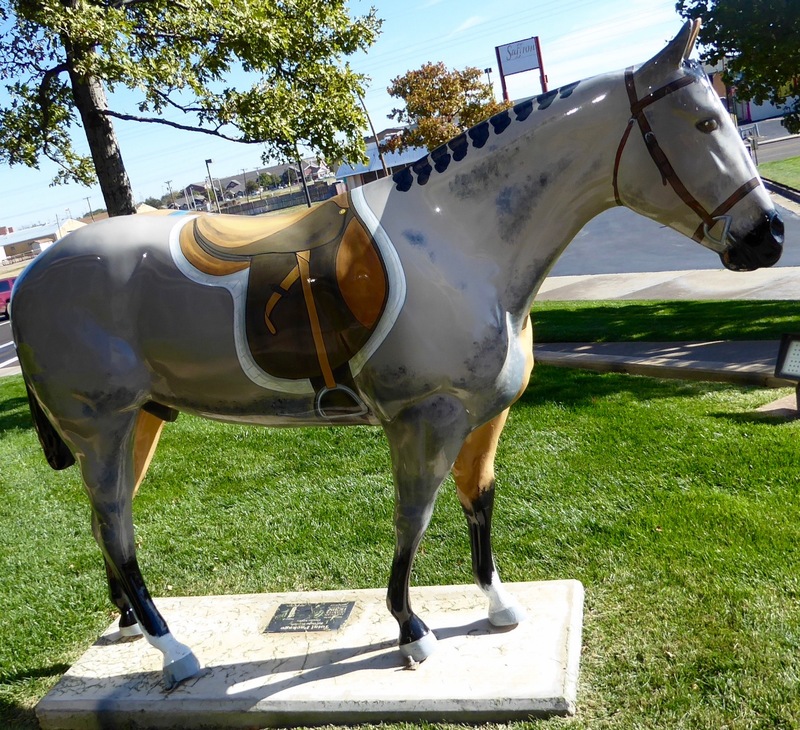 This project of Center City and the American Quarter Horse Association has placed life-sized statues of Quarter Horses painted by regional artists around the area. "Happy" at Happy State Bank. 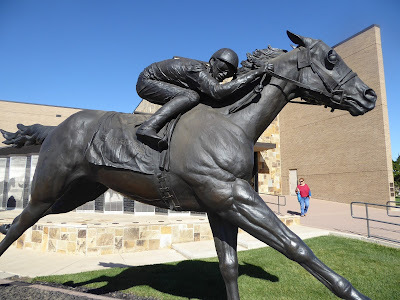 We met City Center Executive Director Beth Whitley Duke, "the mother of horses," over coffee our first morning in Amarillo. 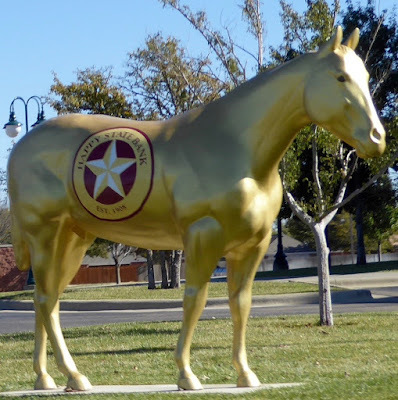 What began with 20 horses in 2002 has grown to 103 unique works and still reproducing. "Reflections of Love" by Jill Wyatt Marshall. All are stallions except for two, a mare sponsored by Hooter's and a spectacular mirrored mosaic mare and foal at the Women and Children's Health Center. They have become the object of family scavenger hunts, photo projects and of devoted fans. Count us among them. "Cherry Lime" by Gary Ward. "When No. 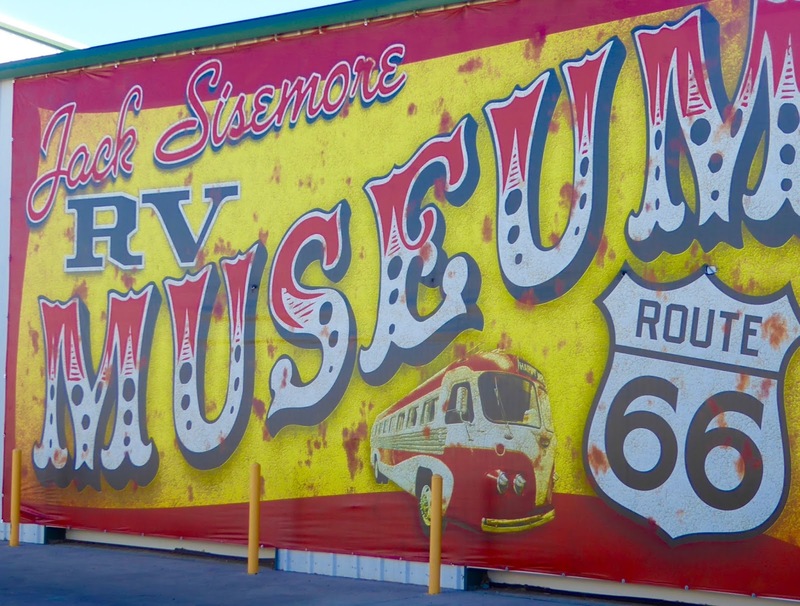 50, "Cherry Lime," at the Sonic Drive-In was removed for repainting, we had calls galore," said Beth. 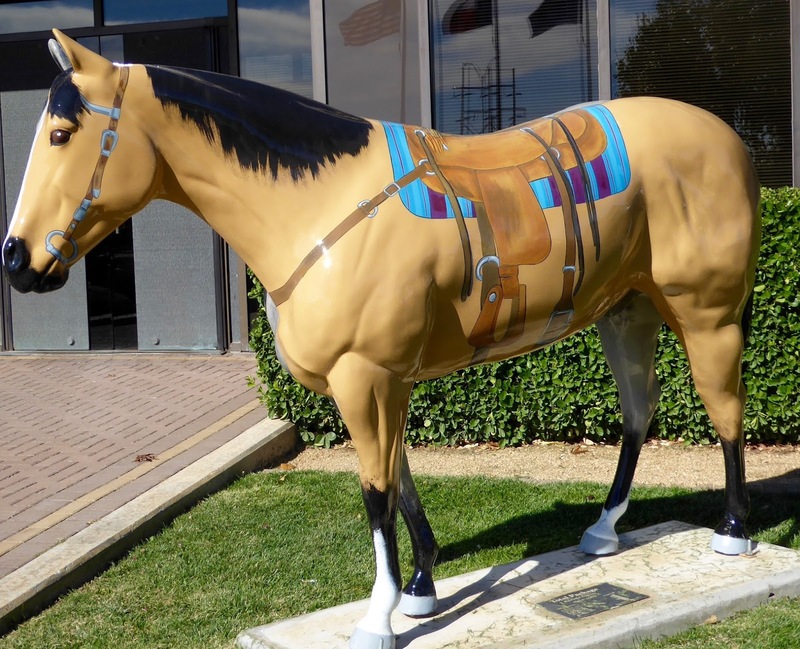 Western of "Total Package" at the American Quarter Horse Hall of Fame and Museum. Evidently, "Don't mess with our horses" has joined "Don't mess with Texas" as an Amarillo warning. English side of "Total Package," artist Gabe Treisio's clever way of showing the breed's versatility. 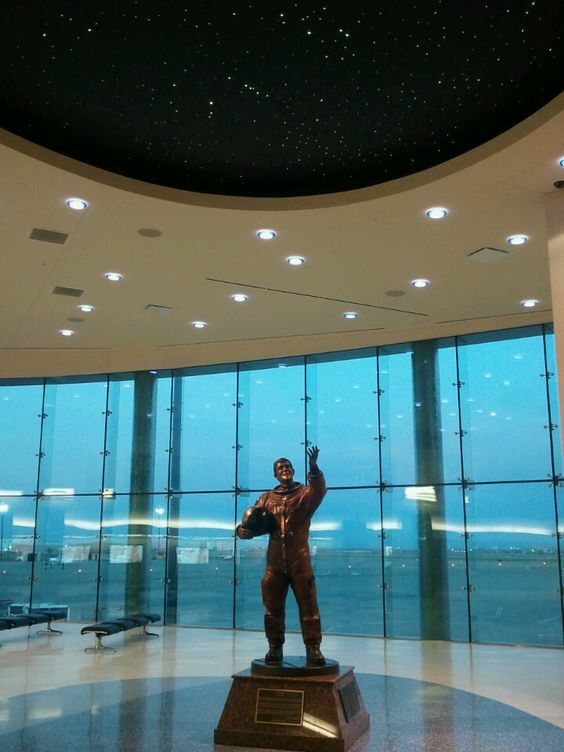 Rick Husband statue in the Amarillo airport named for him. The Good Girls, Debi Lander and Judy Wells, hail from Florida, so a trip to the plains of Texas required a flight to Amarillo. We landed at RickHusband Airport, one of those fine regional airports that never see overly long TSA lines. Incidentally, Rick Husband was a local hero, an astronaut who sadly lost his life when Columbia exploded on reentry. 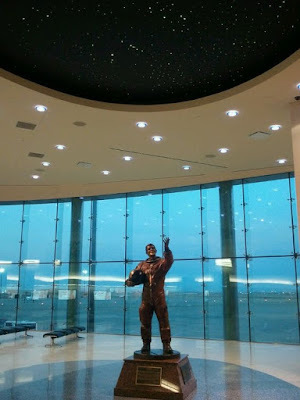 The statue in his honor inside the terminal makes a good meeting point. 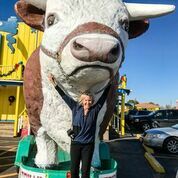 We then picked up our rental car for our annual road trip and headed for downtown Amarillo, an area known for cowboys and cattle. A sign you can't miss. Photo by Debi Lander. We didn’t get very far because we soon passed an icon and simply had to turn back. You can’t miss the Big Tex Steak Ranch sign featuring long-legged Big Tex. 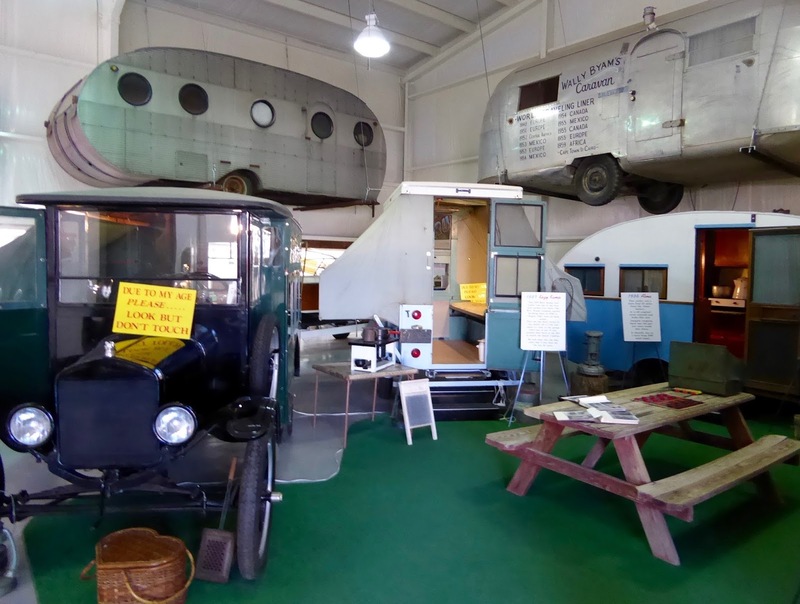 This sprawling restaurant became a beacon for travelers along Route 66 back in the day and later moved to Interstate 40. Perfect for selfies ans souvenir shots. Big Tex caught our eye, and we naturally had to snap some photos. The giant White-faced Hereford steer makes for a fun selfie and is a must for anyone visiting this area. Big Tex-Rex. Photo by Judy Wells. 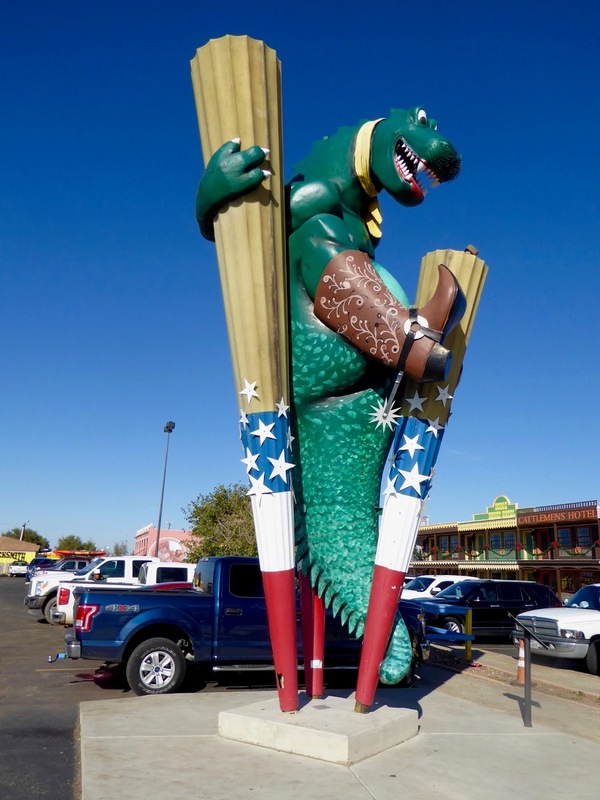 So is Big Tex-Rex, called by the restaurant's founders Spirit of the Mother Road, Route 66. 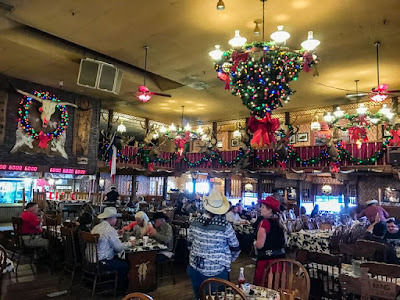 In true Texas spirit, the restaurant was created to satisfy the hunger for good steaks and the ambiance of the Old West. The now World-famous FREE 72-oz. Steak came to life not long after it opened in 1960. Steak Ranch dining room. Photo by Debi Lander. 1 Entire meal must be completed in one hour. If any of the meal is not consumed (swallowed)…YOU LOSE! 3 Once you have started you are not allowed to stand up, leave your table, or have anyone else TOUCH the meal. 4 You will be disqualified if anyone assists you in cutting, preparing or eating your meal. This is YOUR contest. 5 You don’t have to eat the fat, but we will judge this. 7 You are required to pay the full amount up front; if you win we will refund 100%. 8 You must sit at a table that we assign. 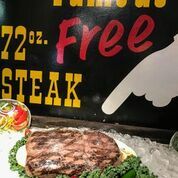 9 If you do not win the steak challenge, you are welcome to take the leftovers with you. 10 No consumption or sharing of the leftovers is allowed in the restaurant once the contest is over. 11 If you fail to complete the challenge, you must pay the full $72 dollars. Texas-themed gift shop. Photo by Judy Wells. Since it was afternoon, no one was attempting to win a steak dinner, so we perused the gift shop. 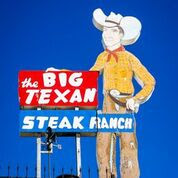 The place reminded us of Wall Drug in South Dakota, kitschy souvenirs celebrating any and everything Texas. While we were thoroughly entertained, we escaped without spending any money. Our downtown hotel, the MarriottCourtyard Amarillo Downtown, was a gem. It’s the restored historic Fisk Building, a former medical arts building, that found new life. 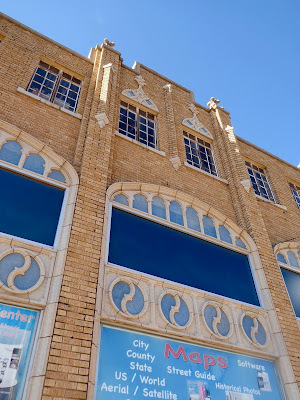 Downtown Amarillo is coming alive, and the Marriott is in the center of the action. Examples of Pueblo Deco. Photos by Judy Wells. Amarillo also is making a concerted effort to save their Art Deco - or as they call it, Pueblo Deco buildings - with design motifs inspired by Pueblo sand paintings, and we applaud their work. 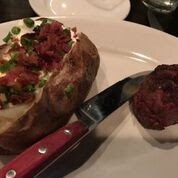 Baked potato and filet mignon at Embers. Photo by Debi Lander. 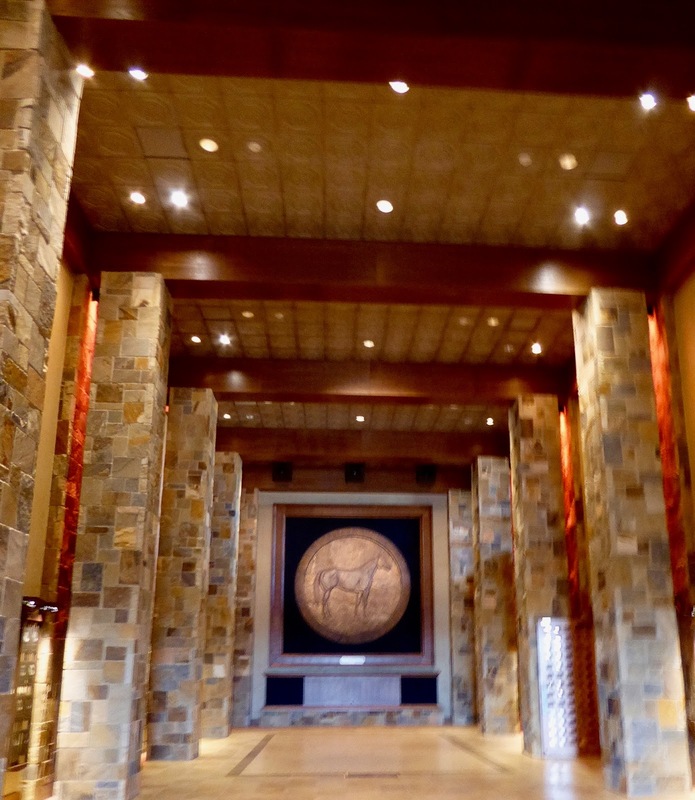 Thanks to Amarillo CVB, Eric Miller, we were treated to a fantastic filet at an upscale restaurant named Embers. The menu featured steaks and seafood, fresh vegetables and steak toppers. Specialties of the house included a yummy fried baked potato that Judy devoured. Debi stuck with the traditional baked potato. Since the Good Girls had recently spent three weeks in China, the steak dinner fulfilled meaty dreams. However, we could not fit in even a bite of the unusual, but we hear scrumptious, jalapeño cheesecake. We returned to the Marriott Courtyard to get ready for a full day of museum hopping the next morning.